I have gotten sidetracked once again, and have gone all domestic…from sewing …to felting …I am now in the middle of a knitting frenzy! I have been knitting steadily since the felting fiasco as I have found it is such a fantastic time filler on the dreaded Tube. Oh, and there is nothing like and audience when you don’t know what you are doing (really, people? Have you never seen anyone knit?? heh). So, bit by bit, I have been slowly pushing myself out of my comfort zone – variations of squares- to things with more complex patterns. I started with a secret project for a friend’s bday, which was a modified square, but had to learn Kitchener Stitch to join it. What a fantastic thing – a stitch that joins two edges but is invisible. Who knew? (many people, apparently). Again, a square, but a new stitch pattern – Seed Stitch- that required I pay attention somewhat. Joined with…you got it…Kitchener Stitch! Then a HAT (which I am, again, very proud of, but have not taken a shot of yet), requiring learning how to decrease stitches. Did I mention our house is COLD? Those required learning to knit on double pointed needles which scared the crap out of me.In the end, they aren’t so bad. A bit scary on the Tube though, with all the pointy bits. The legwarmers have stretched a bit with wearing, though, and are a little big so I think I may have to re-d0 the ribbing so they stay up. That said, they pass nicely as thick slouchy socks when tucked into my booties for wearing out of the house. 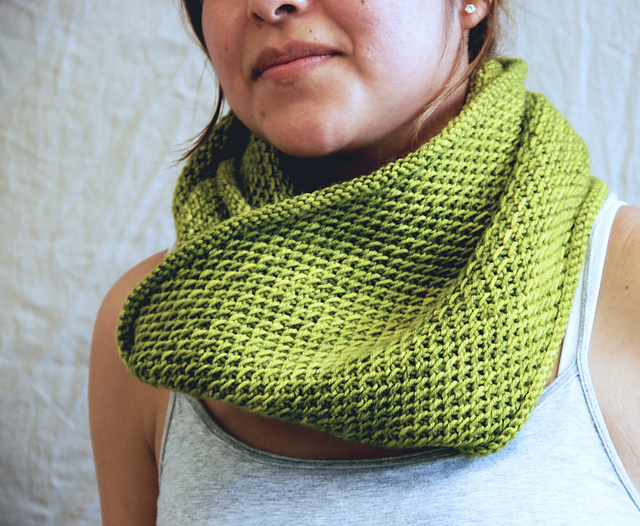 So…the latest step forward is this pretty Honey Cowl (click link for pattern on the fantastic Ravelry site) which I was worried would require too much concentration with my pea brain (awwwk…shiney), but has thus far been ok. 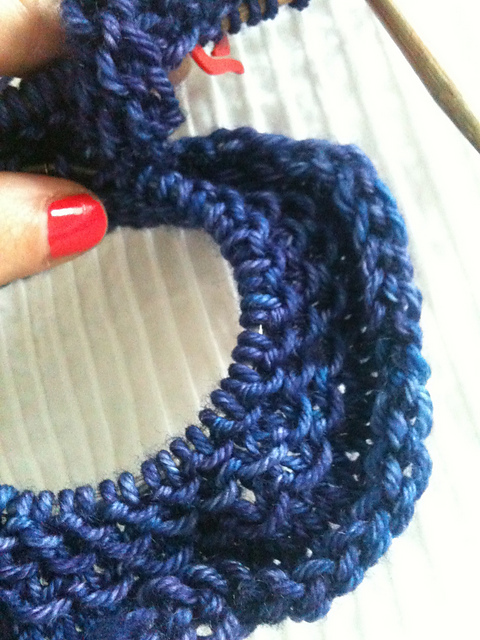 Here is the start in Madelinetosh’s beautiful merino Tosh DK wool in Iris. 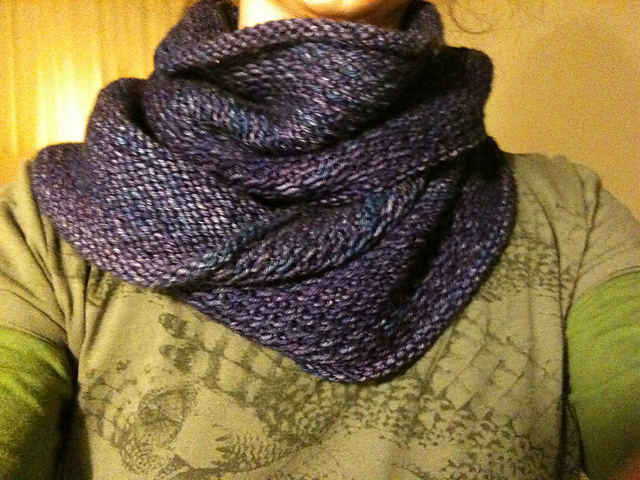 It is a bit more purple in real life and sort of shimmers between purple and indigo. Really gorgeous wool. Not cheap, mind, but it is beautiful to work with and has none of those annoying fuzzy fibres in it (kid mohair, angora) which I despise. I will try to remember to post when done. Oh, and on top of this, I forgot to mention we are prepping the house for the Olympics, as we have decided to try and rent the Roost headquarters to some lovely Olympic-ers and get the hell out of Dodge! Let me know if you hear of anyone looking to rent… we are 10 mins on a direct bus route to the Stadium! I will be posting updated images of the house as we get things all tidied up/finished off for July.